It happens in any hobby, life gets busy and your hobby just slides to the side to wait patiently for you to come back. This is what happened to me with Bullet Journaling for the past couple of months. 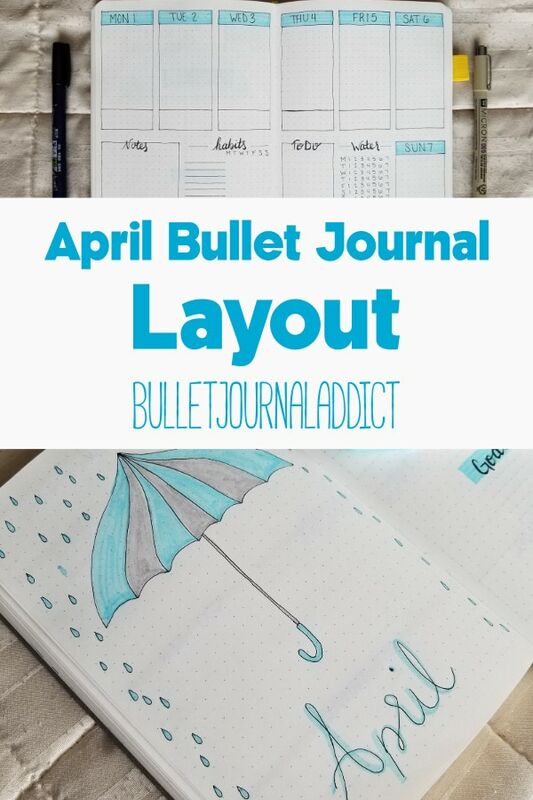 I wanted to spend time in my journal, I even created a March layout. I just didn’t use it. Partly because I left my journal in my bedroom instead of at my desk. Partly because I was so consumed with work through March that I was using electronic planning with Trello. It’s ok though. 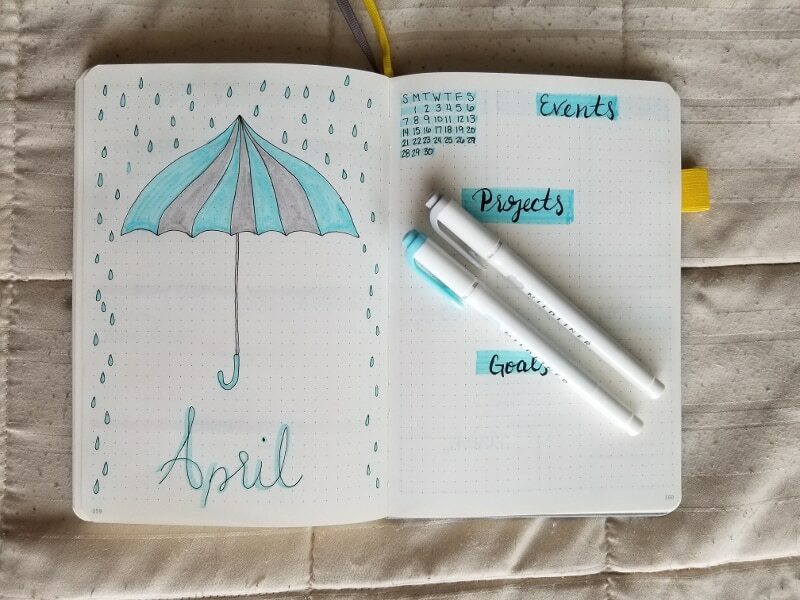 Feeling like a complete scattered – mess I created my April spread and got back to planning. I’ve got my plans, goals, and projects figured out for the month and I’m feeling like I am getting back on track. With Rob’s mom entering retirement we are pretty thrilled. This gives an extra set of hands around the house to help keep it clean and to help out with mini from time to time. I have loads of things I am doing for my mommy blog and business is doing pretty well. I have a master to do list this month that is a mile long but I’m working through it. Last night I stayed up a bit too late to check off a couple of boxes. Lots of goals set for this month including writing quite a bit – both for this blog and the mommy blog. I hope to improve my productivity through all these tasks and make life just a bit easier. 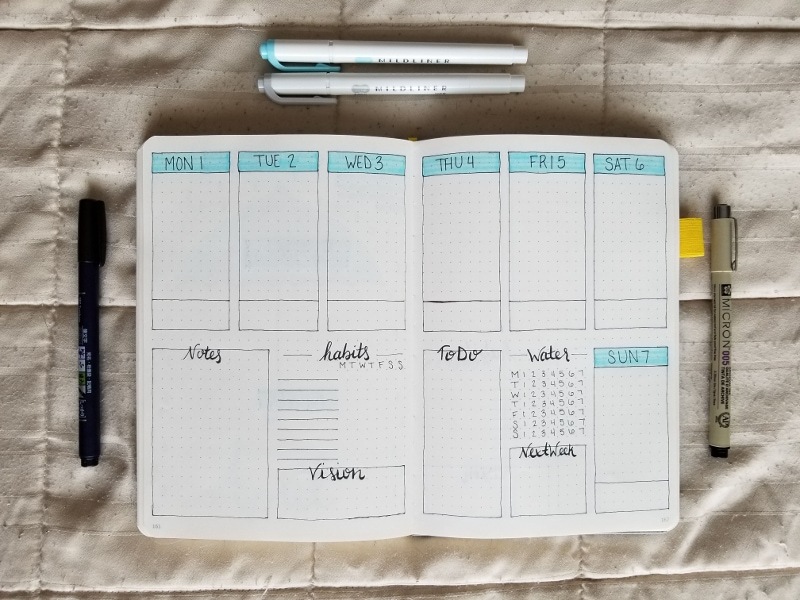 My weekly spread pulled heavily from Kate Louise and her layout here. I modified it to suit my needs more but this makes tracking my needs a lot easier through this jam packed month. 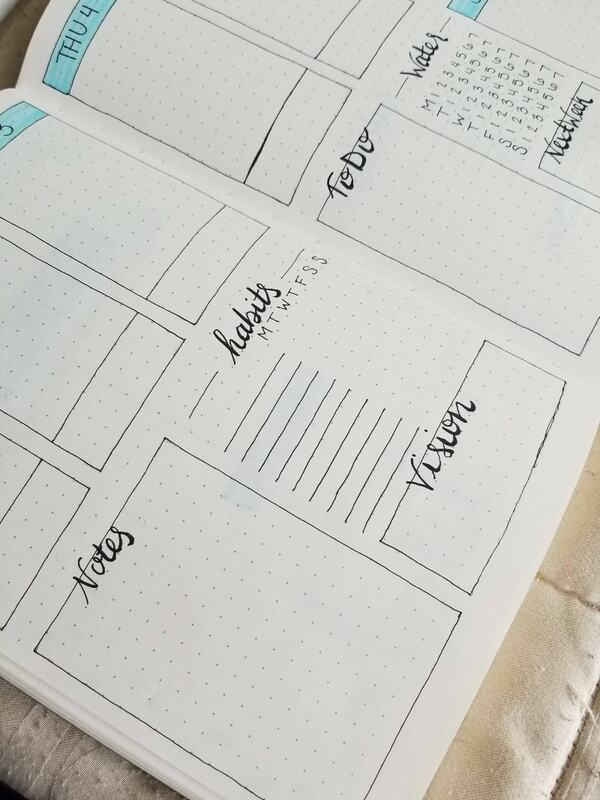 It also saves me from needing to create different spreads for everything and needing to flip through pages. Instead I have one place to look everyday and that’s it. 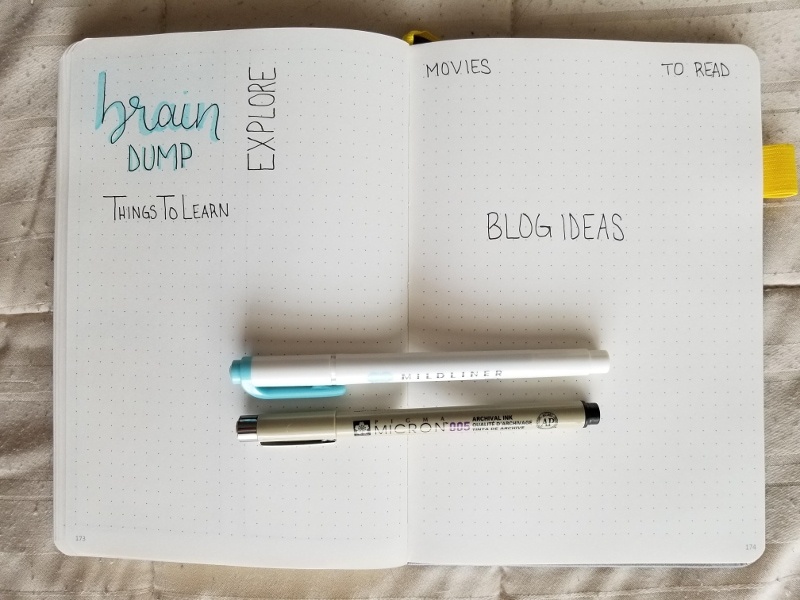 I only added two extra spreads this month to help get my mind organized. 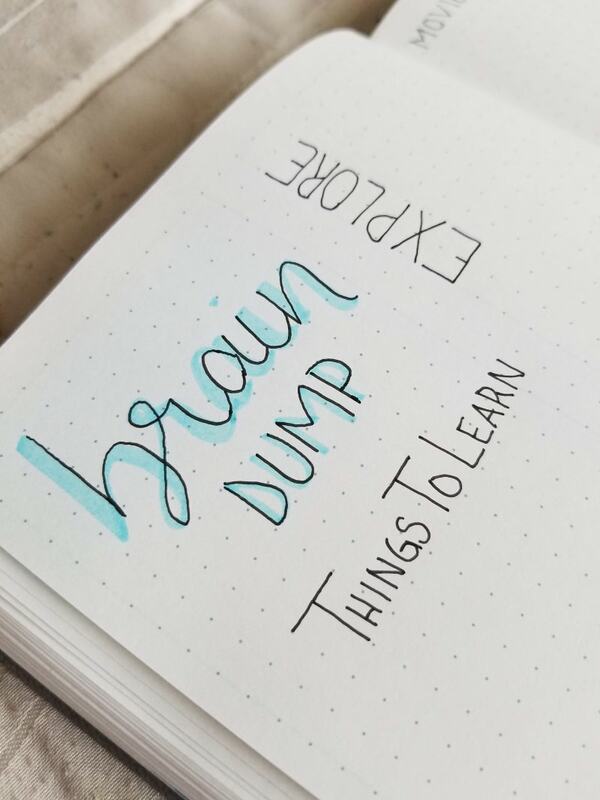 I added a master to do list and a brain dump. These two spreads really help me to organize my thoughts. When I have too much to do I find that it’s helpful to have places to get it all out of my brain. Then I can organize it so I am tackling my tasks with ease. Because I wanted it to be an easy spread to create I used just few different supplies. 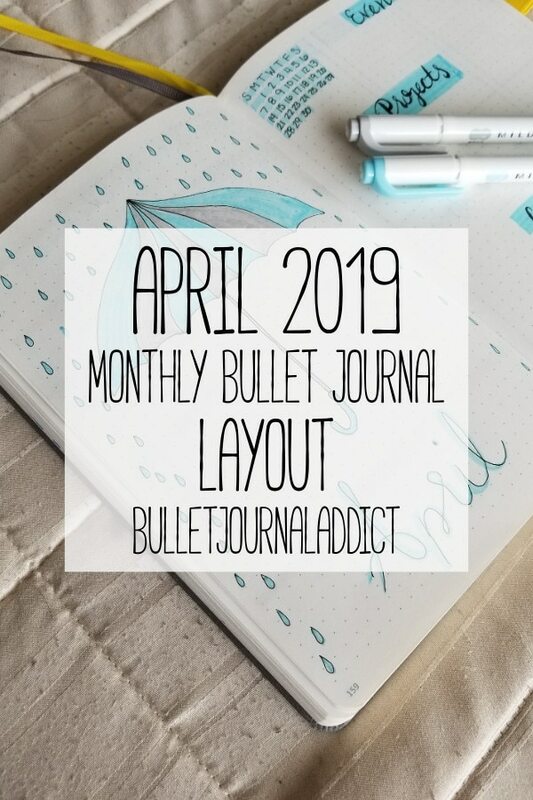 So without further ado let’s look through my bullet journal layout for April. 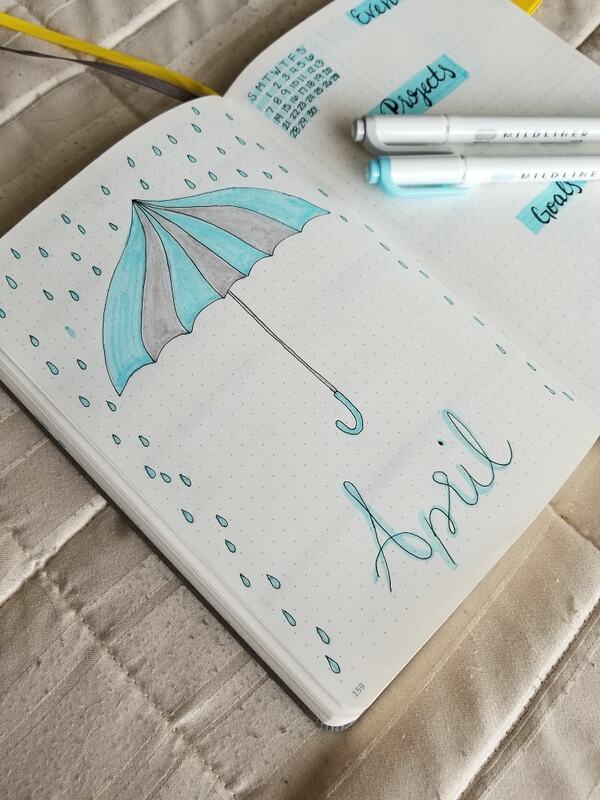 April showers is the theme for this months layout. I wanted this month’s layout to be simple and effective. I didn’t want a lot of jazz because my time is extremely limited. I spent a little bit of time creating the cover page and then moved to a more simple design everywhere else. I recently ordered the Micron set and decided to use the 005 tip pen to create my layout this month. It works wonderfully for all the fine details that I needed in the layout. For the monthly set up I kept it super simple again with a small calendar up in the corner and spots for all the important things. 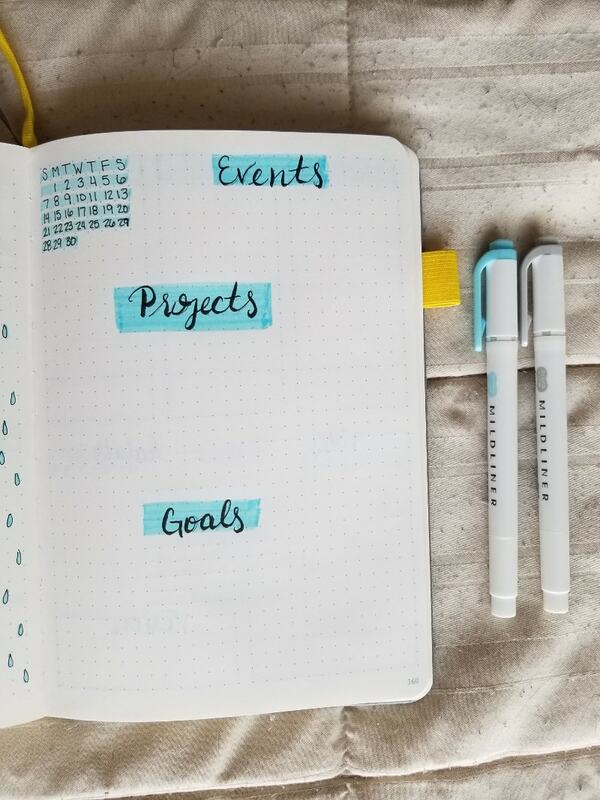 I like to set monthly goals because they always keep me on track. They are in my face and I spend the entire month actively working to achieve the goals I set. I found a set up I absolutely loved a long time ago and never tried because I never thought I would need a setup like this. It’s a detailed set up that tracks almost everything. I still modified the set up a bit by adding a to do list, getting rid of a couple of things, and adding a vision box. I especially like the way the habit tracker turned out. 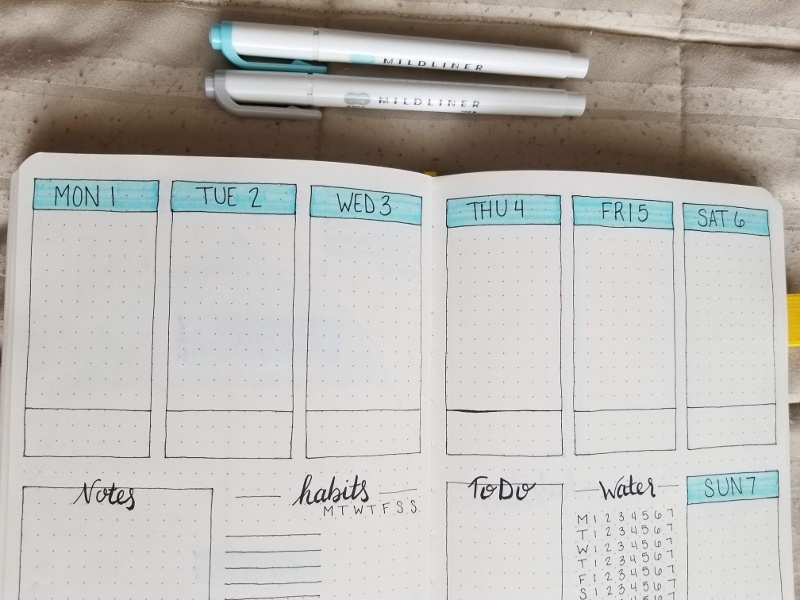 I have not been great at habit tracking for a while but I’m hoping that having it in my weekly spread will help to keep me on track. I have loads of habits that I need to get into this month so I can be prepared for a busy Spring and Summer. I am tracking my water intake again because I’ve been lacking on making sure I’m getting enough water in every single day. The little box at the bottom of each day is meant to record what I am grateful for. This helps me to continue living a more positive life. This is quite possibly one of my favorite spreads to do when life gets busy. 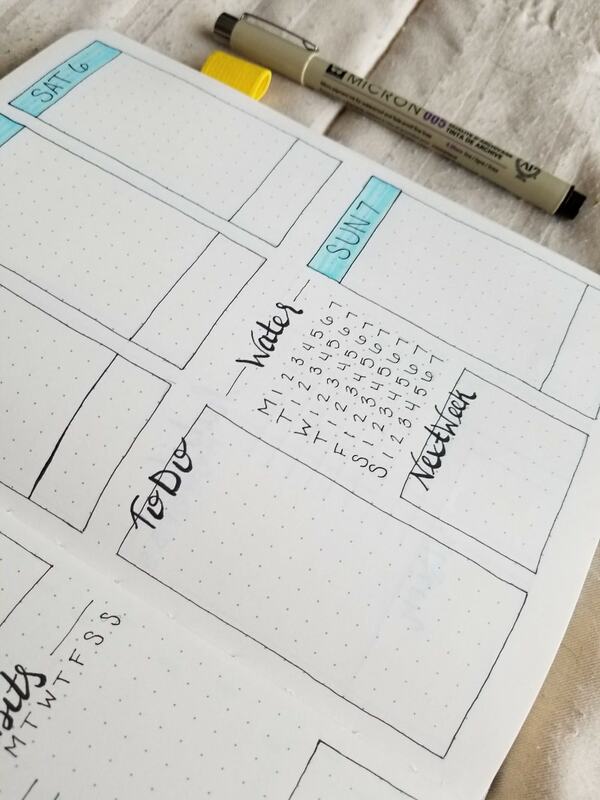 It helps me to track everything I need to get done throughout the month. As I work through some online courses while still needing to get my normal work done this spread keeps me on track. In fact it’s the third and I already have half the spread filled up. If it were not for this spread I would lose my mind trying to remember everything. This second spread is another favorite because I can record all those random thoughts that end up in my head. Ideas, movies to watch, things I want to learn, everything ends up here for further exploration later. Brain dumps are the most effective way for me to control my ADHD. It keeps me from going stir crazy and allows me to remember all the fun ideas that I get. It also means I don’t need to have my desk completely cluttered with post its. Though if I am being honest, I totally have a post it problem because I still have post its all over my desk. So I am back at it for the month of April and hopefully will stay on track through the rest of the year. 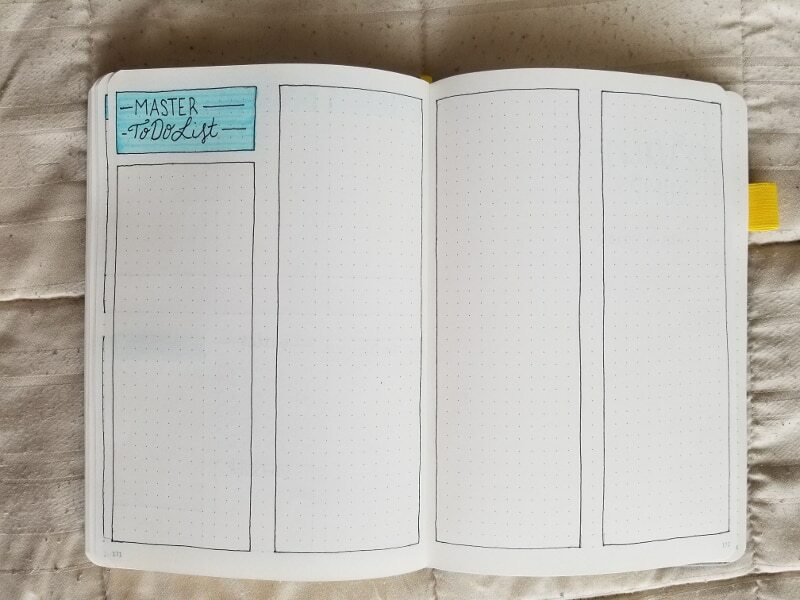 If you haven’t tried a month master to do list or a brain dump in your journal yet I highly recommend it. A special thanks to Kate Louise for her wonderful weekly set up idea and easily modifiable template. For more like this make sure you follow me on Pinterest. 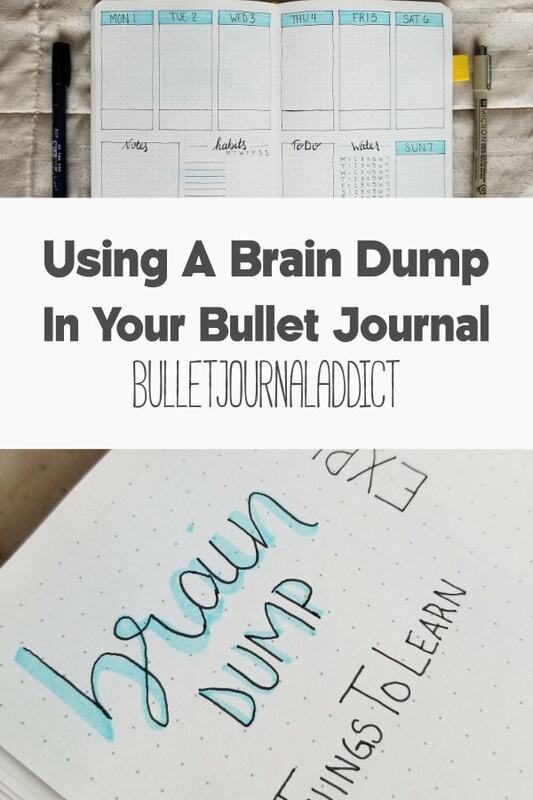 Also pin this to your favorite bullet journal boards.